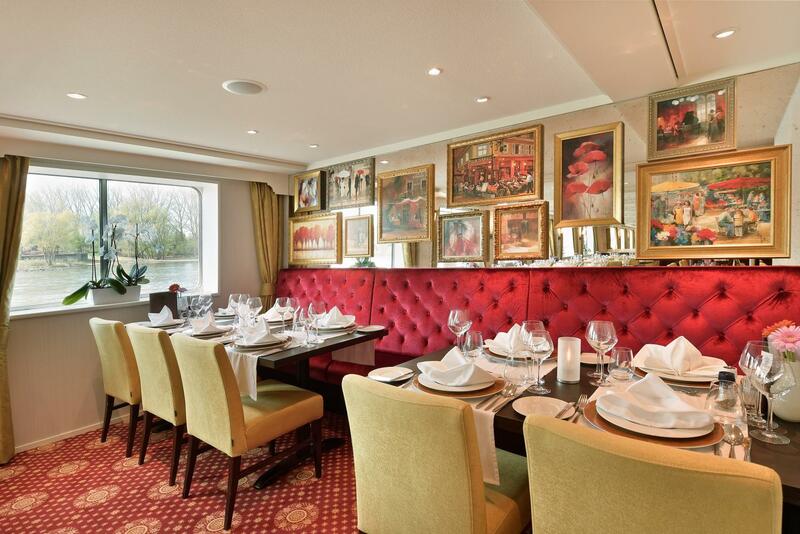 You will want for nothing aboard this beautiful intimate ship. The relaxed atmosphere and high quality service make every trip a real pleasure. 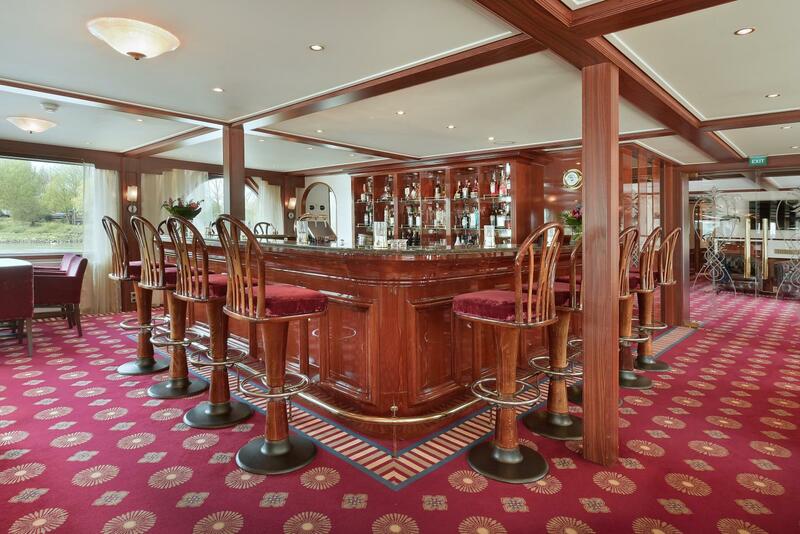 It is no coincidence that many guests regularly return on board. 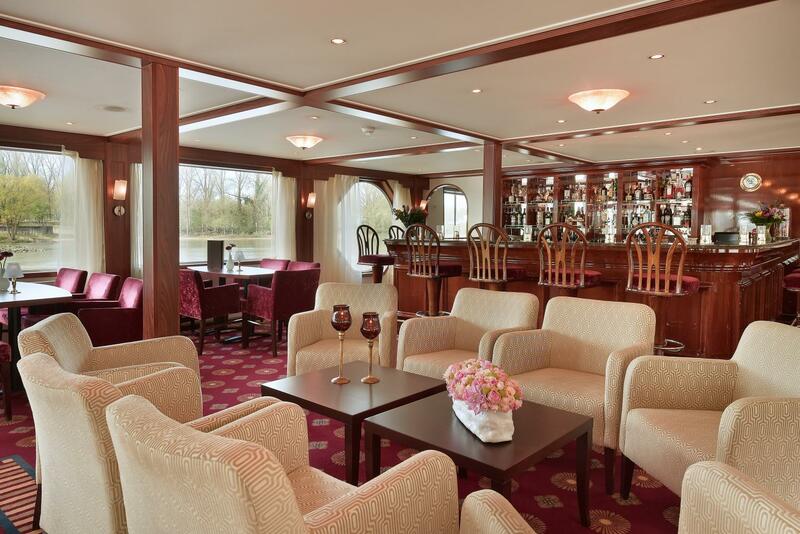 From the central lobby you can go to the Sun Deck and the restaurant on the Main Deck by stairs or stair lift. 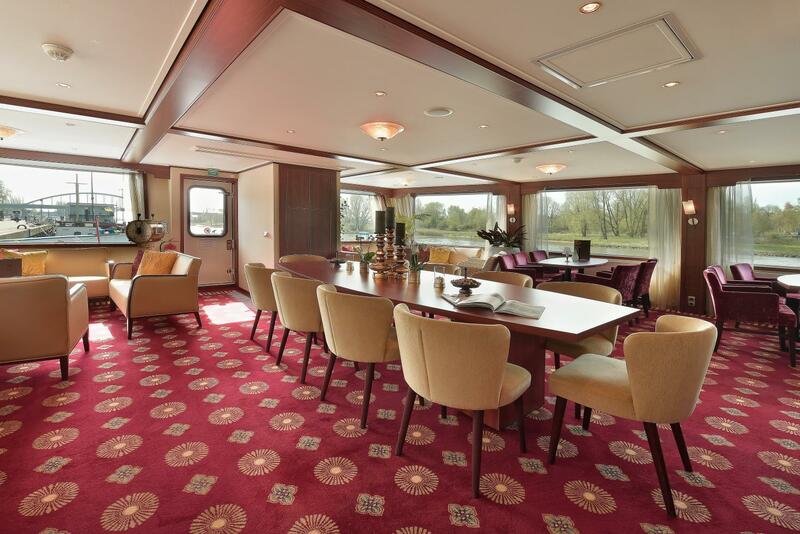 The cabins on the Main Deck can also be reached by stairs or stair lift (max. 120 kg). Your room has been composed with care and are equipped with comfortable beds, air conditioning, television, safe, sufficient cupboard space, a desk and a large sliding window. The bathroom has a sink, shower and toilet. With your mobile, tablet or laptop you can access the internet via Wi-Fi. During the day, the crew folds up one bed into a bench. The only exceptions are the 3-person cabins. The 3-person cabin on the Promenade Deck (cabin 120) is equipped with a single bed and a bunk bed. The 3-person cabin on the Main Deck (cabin 3) has 3 low beds. Early birds can enjoy a fresh cup of coffee or tea before breakfast. Then we serve a generous breakfast buffet in the restaurant. 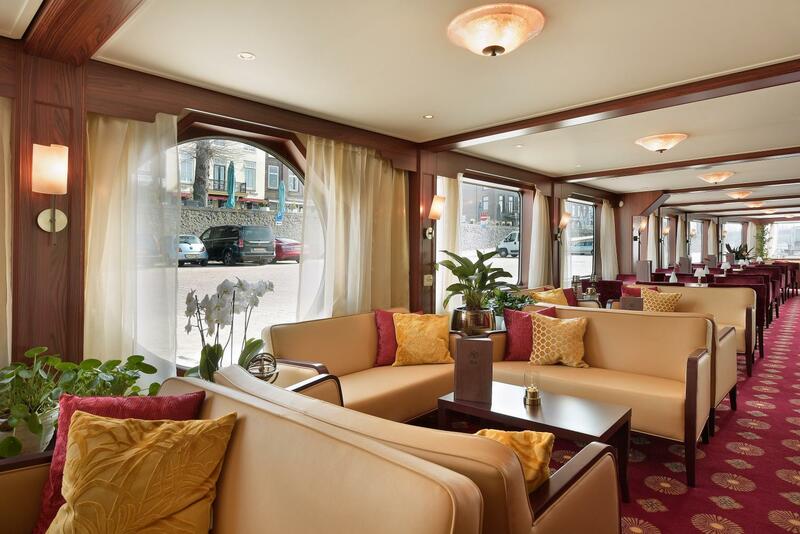 In the course of the morning we serve coffee or tea in the lounge or with nice weather on the Sun Deck, sometimes with something extra. If we are sailing in the afternoon there is even a High Tea. The free coffee and tea corner, located in the central hall, is available day and night. We serve lunch partly from the buffet and partly at the table. At the 4-course dinner, which is served at the table, you can choose from different main dishes and desserts. All your expenses on board such as refreshments and souvenirs are booked on your on-board account which you can pay at the end of your trip by cash, bank card or credit card (VISA or Mastercard). Excursions are only for cash payment. Free WiFi on the entire ship (limited reception) in all countries. Owner of the m.p.s. 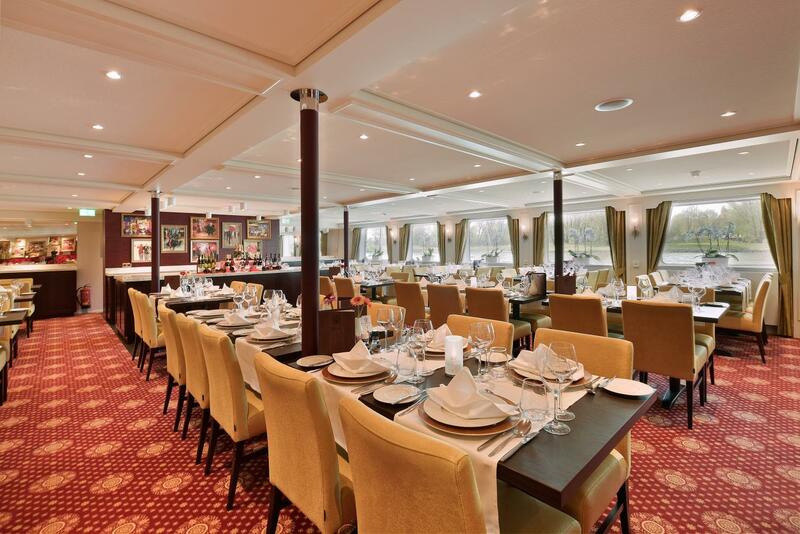 Poseidon and exporter of the cruises with this ship is Filmar B.V. - Oss. The Netherlands and Belgium are bursting with history. This is really reflected on a trip like this, with visits to places such as Kinderdijk, Antwerp, Hasselt and Heusden. In thirteen days, you'll visit charming town centres, beautiful fortresses, castles and listed buildings. One of the best times to take a river cruise on the Romantic Rhine is when the grapes are being harvested. There is plenty of activity in the attractive wine towns of Coblenz and Rüdesheim which are getting ready to pick the grapes from the vines in time. 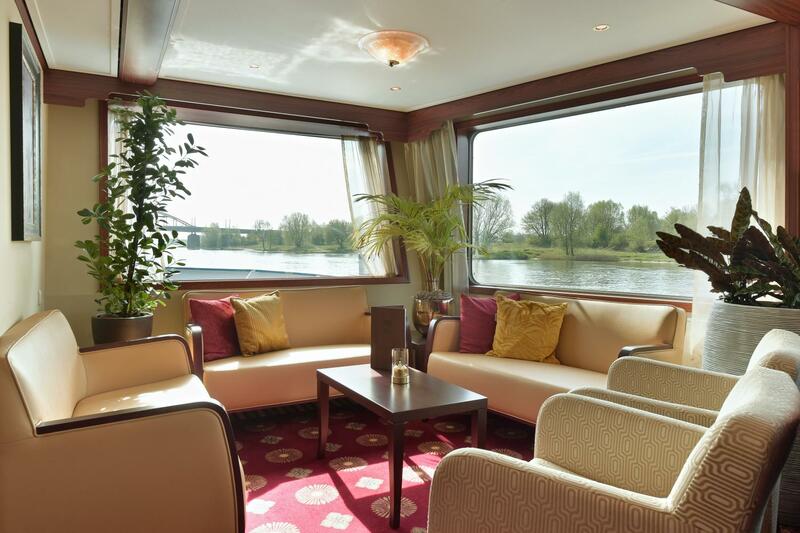 You can enjoy beautiful views as you sail and there are plenty of opportunities to sample a glass of delicious Rhine wine.